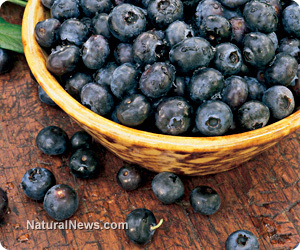 (NaturalNews) Blueberries are well known as being one of the superfoods prized by health experts. While it is important to remember that eating a well balanced diet is the key to good health, there are a number of foods that have been shown to have particularly promising health benefits. It is often that these superfoods have a particularly high level of beneficial components that are optimal in ensuring good health. While there are a number of tasty and nutritious foods that are on the list of superfoods, blueberries continuously top any list of that nature. Not only are blueberries delicious and convenient to eat, their antioxidant qualities make them the star component in the diet of anyone who is concerned about their optimal health. The antioxidants contained within these berries are known to help cells across the body fight off disease. While studies in the past have shown a positive relationship between blueberries and a lowered risk of heart disease, it is sometimes difficult to tease out which foods in the diet are the actual ones that are making these positive outcomes. To address this issue, researchers in Maine decided to take a different approach. Because the eating habits of lab rats are able to be better controlled, they make the ideal vehicle to track changes made by eating blueberries. The obese rats were divided into two groups so the effects of their eating habits could be better monitored. Researchers fed one group what equated to two cups of wild blueberries while the other group received no blueberries. The study lasted for eight weeks. After only eight weeks, researchers noticed a significant improvement in the ease in which the veins of the rats on the blueberry diet expanded and constricted. This elasticity helped to lower the blood pressure of those rats. The researchers point the antioxidants present in blueberries as the reason for the reduction of inflammation and, eventually, reversing the devastating effects of metabolic syndrome. It is studies such as this one that underscore the need to eat a diet high in nutrient dense foods. In addition to good health in the present, such a diet can help ensure good health in the future.